The imminent Rio Summer Olympic games are set to kick-off in Rio de Janeiro, Brazil this coming August. Despite longing to be in the midst of the leading international sporting event, the reality is that most of us won’t get a chance to experience Rio Olympics 2016 live. However, technology offers a hyper-reality alternative for spectators to get a futuristic experience that promises to be almost indistinguishable from the reality of being a part of the Olympic games this year, through the use Virtual Reality. Professional sport has remained at the forefront of virtual reality and augmented reality – demonstrated by the virtual first-down line and the early hockey puck glow. The future of sports is tied with the reality of Virtual Reality and Augmented Reality. Sports spectators will soon be able to experience the thrill of live sporting events from almost anywhere, making the celebrated High Definition technology of today seem antiquated in comparison. Athletes will also benefit from the advanced analytics and improved training experiences as they will be able to recreate real life situation during practice. While Caster Semenya will be competing to be the fastest middle-runner and Chad Le Clos will seek to realise his ambition of being the fastest swimmer in the pool, another competition will be taking place outside the Olympics arena. This year’s Olympics will also be a platform for the ultimate test of the viability of Virtual Reality and how effective (and realistic) it is in sports broadcasting in the current day-and-age. This past week, NBC announced that it would be providing a total of 85 hours of broadcast of the Rio Olympic games in Virtual Reality. The broadcast television network has partnered with technology giant, Samsung to make this a reality for sports fans around the world. Users of Samsung Galaxy smartphones and the Samsung Gear Virtual Reality headset will be able to experience both the opening and closing ceremonies and a host of other events, including the finals and semi-final matches of the men’s basketball, gymnastics, beach volleyball, boxing, fencing, track and field, and diving in 360 degrees, with full control over which direction to look as though you were there in the heart of the action. NBC is set to also release Virtual Reality highlight packages for the listed sporting events. The VR footage will be filmed by the Olympic Broadcasting Services (OBS), a unit conceived by the International Olympics Committee to serve as the Host Broadcaster for all the Olympic games, providing video feeds to international broadcasters. The videos will not be livestreamed however, instead events will be presented on delay. The opening ceremony is set to be available for VR the day after the actual event. Delaying the footage makes sense to ensure that the outcome is up to par high quality standard. Despite this, the Virtual Reality (360 degree) Rio Olympic 2016 events will be a worthwhile once in a lifetime experience. Samsung is the Worldwide Olympic Partner in the Wireless Communications Equipment category. 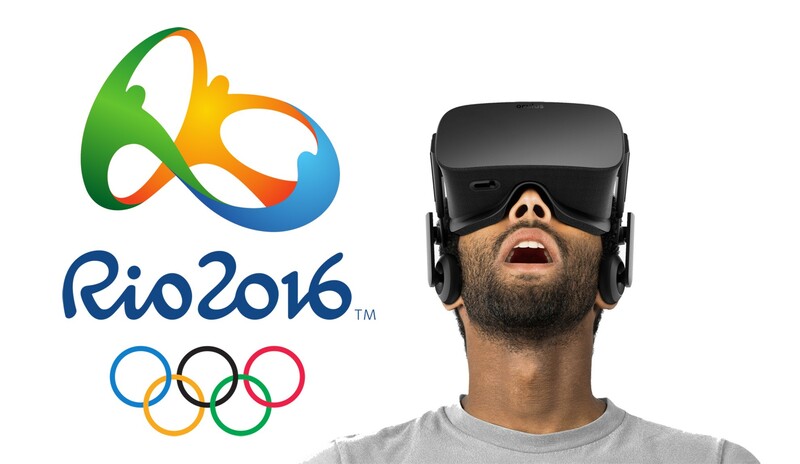 The partnership with Samsung means that in order to view the Rio Olympics in Virtual Reality, you will need the Samsung Gear VR mobile headset, a compatible smartphone – including, the Samsung Galaxy S7, Galaxy S7 Edge, Galaxy S6, Galaxy S6 Edge, Galaxy S6 Edge+ and Galaxy Note 5 – and you will be required to download the NBC Sports App. Despite the collaboration between Samsung and Oculus, there hasn’t been any indication that Oculus Rift users will be offered the same experience. In 2014, Samsung announced that they were collaborating with Oculus VR (a virtual reality stat-up owned by Facebook) to develop a virtual reality headset that would allow for Virtual Reality interaction for flagship smartphones manufactured by the global leading company. The Samsung Gear VR was unveiled at a press conference in Berlin, Germany. In November 2015, the Samsung Gear VR was officially released, making Samsung one of the first to market with the virtual reality headset and the first to garner mainstream attention. The headset is able to support below 20ms Motion to Photon (MTP) latency. The Gear VR unit acts as the controller while the (compatible) smartphone device functions as the headset’s display and processor. The Gear VR is equipped with a custom-built inertial measurement unit (IMU) that connects to the mobile device through micro-USB and allows for rotational tracking. To download content- such as revolutionary games and VR experiences – for the Samsung Gear VR, the main facility is Oculus. The Oculus website also serves as the main line for software distribution on the Gear VR. The broadcast of the Rio Olympic sporting events in Virtual Reality is an important step in the right direction for the technology which has promised to change the way audiences experience content for some time. Sports and technology enthusiast will finally get a chance to witness the potential effectiveness of VR in live sport broadcast this year.